In the Sunday New York Times there was an article about addiction. 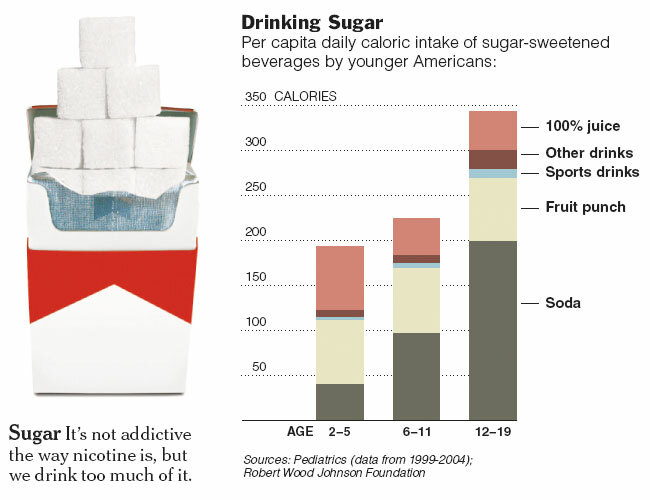 The addiction that too many Americans (and Canadians, too) have to sugar beverages. Here is the chart from the article. I’m not entirely certain how anyone between 2-5 could even know what soda tastes like and I realize that I write this from a point of privilege and access to a variety of healthy food options. I was drinking a minimum of three diet sodas a day. And I know I wasn’t drinking sugar. I was drinking plenty of other chemicals though, and that I didn’t like very much. I recently decided to give up soda in my diet. It was not an easy decision for me because I was so accustomed to drinking it, and also used it as a source for caffeine (though I was never one of those ‘diet coke with breakfast people.’ I do have soda every once in a while. I find it particularly difficult to be at the movies and have popcorn without soda. I’m working on it though. I can drink a lot of this water and because it is sodium-free it is fantastic. I don’t necessarily love that I am drinking so much from plastic bottles. I have investigated seltzer makers and it seems that the gas cartridges to make the seltzer are quite difficult to get in Canada. If anyone has experience that is different, please share. How much soda/pop do you drink? 2 Responses to Are you an addict? I think it would be very hard to live in North America and not be addicted to sugar – it is in everything – obvious and hidden…. So I guess the answer is… yes.